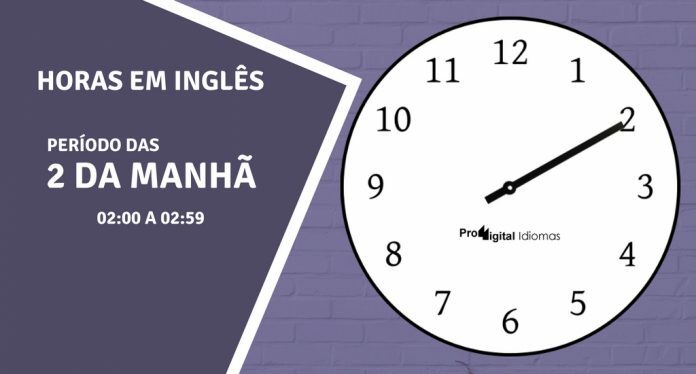 Estamos chegando às 2 horas da manhã e por isso vamos estar aprendendo a escrever todas as horas em inglês por extenso dentro do período das 2:00 as 2:59. Então continue abaixo e vamos estudar as diversas opções de como escrever as horas em inglês. São muitas opções para se memorizar. Obviamente não há a necessidade de tentar memoriza-las tudo de uma só vez. A ideia é fazer um aprendizado das estruturas de escritas de cada um dela, ou seja, aprender as opções de montagem para se escrever as horas em inglês. E para te ajudar nessa, a ferramenta Anki é uma grande amiga. Com ela você poderá colocar todas as estruturas que você estiver com dificuldade de memoriza-las, e a ferramenta irá rotaciona-las em dias e semanas diferentes para você estar sempre relembrando. Conheça mais sobre o Anki e saiba como baixa-lo (grátis). One minute past two One minute past two a.m.
One past two One past two a.m.
Fifty-nine minutes to three Fifty-nine minutes to three a.m.
Two one Two one a.m.
Two minutes past two Two minutes past two a.m.
Two past two Two past two a.m.
Fifty-eight minutes to three Fifty-eight minutes to three a.m.
Two two Two two a.m.
Three minutes past two Three minutes past two a.m.
Three past two Three past two a.m.
Fifty-seven minutes to three Fifty-seven minutes to three a.m.
Two three Two three a.m.
Four minutes past two Four minutes past two a.m.
Four past two Four past two a.m.
Fifty-six minutes to three Fifty-six minutes to three a.m.
Two four Two four a.m.
Five minutes past two Five minutes past two a.m.
Five past two Five past two a.m.
Fifty-five minutes to three Fifty-five minutes to three a.m.
Two five Two five a.m.
Six minutes past two Six minutes past two a.m.
Six past two Six past two a.m.
Fifty-four minutes to three Fifty-four minutes to three a.m.
Two six Two six a.m. Seven minutes past two Seven minutes past two a.m. Seven past two Seven past two a.m.
Fifty-three minutes to three Fifty-three minutes to three a.m.
Two seven Two seven a.m. Eight minutes past two Eight minutes past two a.m. Eight past two Eight past two a.m.
Fifty-two minutes to three Fifty-two minutes to three a.m.
Two eight Two eight a.m.
Nine minutes past two Nine minutes past two a.m.
Nine past two Nine past two a.m.
Fifty-one minutes to three Fifty-one minutes to three a.m.
Two nine Two nine a.m. Ten minutes past two Ten minutes past two a.m. Ten past two Ten past two a.m.
Fifty minutes to three Fifty minutes to three a.m.
Two ten Two ten a.m.
Eleven minutes past two Eleven minutes past two a.m.
Eleven past two Eleven past two a.m.
Forty-nine minutes to three Forty-nine minutes to three a.m.
Two eleven Two eleven a.m.
Twelve minutes past two Twelve minutes past two a.m.
Twelve past two Twelve past two a.m.
Forty-eight minutes to three Forty-eight minutes to three a.m.
Two twelve Two twelve a.m.
Thirteen minutes past two Thirteen minutes past two a.m.
Thirteen past two Thirteen past two a.m.
Forty-seven minutes to three Forty-seven minutes to three a.m.
Two thirteen Two thirteen a.m.
Fourteen minutes past two Fourteen minutes past two a.m.
Fourteen past two Fourteen past two a.m.
Forty-six minutes to three Forty-six minutes to three a.m.
Two fourteen Two fourteen a.m.
Fifteen minutes past two Fifteen minutes past two a.m.
Fifteen past two Fifteen past two a.m.
Forty-five minutes to three Forty-five minutes to three a.m.
Two fifteen Two fifteen a.m.
A quarter past two A quarter past two a.m.
Sixteen minutes past two Sixteen minutes past two a.m.
Sixteen past two Sixteen past two a.m.
Forty-four minutes to three Forty-four minutes to three a.m.
Two sixteen Two sixteen a.m.
Seventeen minutes past two Seventeen minutes past two a.m.
Seventeen past two Seventeen past two a.m.
Forty-three minutes to three Forty-three minutes to three a.m.
Two seventeen Two seventeen a.m.
Eighteen minutes past two Eighteen minutes past two a.m.
Eighteen past two Eighteen past two a.m.
Forty-two minutes to three Forty-two minutes to three a.m.
Two eighteen Two eighteen a.m.
Nineteen minutes past two Nineteen minutes past two a.m.
Nineteen past two Nineteen past two a.m.
Forty-one minutes to three Forty-one minutes to three a.m.
Two nineteen Two nineteen a.m.
Twenty minutes past two Twenty minutes past two a.m.
Twenty past two Twenty past two a.m.
Forty minutes to three Forty minutes to three a.m.
Two twenty Two twenty a.m.
Twenty-one minutes past two Twenty-one minutes past two a.m.
Twenty-one past two Twenty-one past two a.m.
Thirty-nine minutes to three Thirty-nine minutes to three a.m.
Two twenty-one Two twenty-one a.m.
Twenty-two minutes past two Twenty-two minutes past two a.m.
Twenty-two past two Twenty-two past two a.m.
Thirty-eight minutes to three Thirty-eight minutes to three a.m.
Two twenty-two Two twenty-two a.m.
Twenty-three minutes past two Twenty-three minutes past two a.m.
Twenty-three past two Twenty-three past two a.m.
Thirty-seven minutes to three Thirty-seven minutes to three a.m.
Two twenty-three Two twenty-three a.m.
Twenty-four minutes past two Twenty-four minutes past two a.m.
Twenty-four past two Twenty-four past two a.m.
Thirty-six minutes to three Thirty-six minutes to three a.m.
Two twenty-four Two twenty-four a.m.
Twenty-five minutes past two Twenty-five minutes past two a.m.
Twenty-five past two Twenty-five past two a.m.
Thirty-five minutes to three Thirty-five minutes to three a.m.
Two twenty-five Two twenty-five a.m.
Twenty-six minutes past two Twenty-six minutes past two a.m.
Twenty-six past two Twenty-six past two a.m.
Thirty-four minutes to three Thirty-four minutes to three a.m.
Two twenty-six Two twenty-six a.m.
Twenty-seven minutes past two Twenty-seven minutes past two a.m.
Twenty-seven past two Twenty-seven past two a.m.
Thirty-three minutes to three Thirty-three minutes to three a.m.
Two twenty-seven Two twenty-seven a.m.
Twenty-eight minutes past two Twenty-eight minutes past two a.m.
Twenty-eight past two Twenty-eight past two a.m.
Thirty-two minutes to three Thirty-two minutes to three a.m.
Two twenty-eight Two twenty-eight a.m.
Twenty-nine minutes past two Twenty-nine minutes past two a.m.
Twenty-nine past two Twenty-nine past two a.m.
Thirty-one minutes to three Thirty-one minutes to three a.m.
Two twenty-nine Two twenty-nine a.m.
Thirty minutes past two Thirty minutes past two a.m.
Thirty past two Thirty past two a.m.
Thirty minutes to three Thirty minutes to three a.m.
Two thirty Two thirty a.m.
Half past two Half past two a.m.
Thirty-one minutes past two Thirty-one minutes past two a.m.
Thirty-one past two Thirty-one past two a.m.
Twenty-nine minutes to three Twenty-nine minutes to three a.m.
Two thirty-one Two thirty-one a.m.
Thirty-two minutes past two Thirty-two minutes past two a.m.
Thirty-two past two Thirty-two past two a.m.
Twenty-eight minutes to three Twenty-eight minutes to three a.m.
Two thirty-two Two thirty-two a.m.
Thirty-three minutes past two Thirty-three minutes past two a.m.
Thirty-three past two Thirty-three past two a.m.
Twenty-seven minutes to three Twenty-seven minutes to three a.m.
Two thirty-three Two thirty-three a.m.
Thirty-four minutes past two Thirty-four minutes past two a.m.
Thirty-four past two Thirty-four past two a.m.
Twenty-six minutes to three Twenty-six minutes to three a.m.
Two thirty-four Two thirty-four a.m.
Thirty-five minutes past two Thirty-five minutes past two a.m.
Thirty-five past two Thirty-five past two a.m.
Twenty-five minutes to three Twenty-five minutes to three a.m.
Two thirty-five Two thirty-five a.m.
Thirty-six minutes past two Thirty-six minutes past two a.m.
Thirty-six past two Thirty-six past two a.m.
Twenty-four minutes to three Twenty-four minutes to three a.m.
Two thirty-six Two thirty-six a.m.
Thirty-seven minutes past two Thirty-seven minutes past two a.m.
Thirty-seven past two Thirty-seven past two a.m.
Twenty-three minutes to three Twenty-three minutes to three a.m.
Two thirty-seven Two thirty-seven a.m.
Thirty-eight minutes past two Thirty-eight minutes past two a.m.
Thirty-eight past two Thirty-eight past two a.m.
Twenty-two minutes to three Twenty-two minutes to three a.m.
Two thirty-eight Two thirty-eight a.m.
Thirty-nine minutes past two Thirty-nine minutes past two a.m.
Thirty-nine past two Thirty-nine past two a.m.
Twenty-one minutes to three Twenty-one minutes to three a.m.
Two thirty-nine Two thirty-nine a.m.
Forty minutes past two Forty minutes past two a.m.
Forty past two Forty past two a.m.
Twenty minutes to three Twenty minutes to three a.m.
Two forty Two forty a.m.
Forty-one minutes past two Forty-one minutes past two a.m.
Forty-one past two Forty-one past two a.m.
Nineteen minutes to three Nineteen minutes to three a.m.
Two forty-one Two forty-one a.m.
Forty-two minutes past two Forty-two minutes past two a.m.
Forty-two past two Forty-two past two a.m.
Eighteen minutes to three Eighteen minutes to three a.m.
Two forty-two Two forty-two a.m.
Forty-three minutes past two Forty-three minutes past two a.m.
Forty-three past two Forty-three past two a.m.
Seventeen minutes to three Seventeen minutes to three a.m.
Two forty-three Two forty-three a.m.
Forty-four minutes past two Forty-four minutes past two a.m.
Forty-four past two Forty-four past two a.m.
Sixteen minutes to three Sixteen minutes to three a.m.
Two forty-four Two forty-four a.m.
Forty-five minutes past two Forty-five minutes past two a.m.
Forty-five past two Forty-five past two a.m.
Fifteen minutes to three Fifteen minutes to three a.m.
Two forty-five Two forty-five a.m.
A quarter to three A quarter to three a.m.
Forty-six minutes past two Forty-six minutes past two a.m.
Forty-six past two Forty-six past two a.m.
Fourteen minutes to three Fourteen minutes to three a.m.
Two forty-six Two forty-six a.m.
Forty-seven minutes past two Forty-seven minutes past two a.m.
Forty-seven past two Forty-seven past two a.m.
Thirteen minutes to three Thirteen minutes to three a.m.
Two forty-seven Two forty-seven a.m.
Forty-eight minutes past two Forty-eight minutes past two a.m.
Forty-eight past two Forty-eight past two a.m.
Twelve minutes to three Twelve minutes to three a.m.
Two forty-eight Two forty-eight a.m.
Forty-nine minutes past two Forty-nine minutes past two a.m.
Forty-nine past two Forty-nine past two a.m.
Eleven minutes to three Eleven minutes to three a.m.
Two forty-nine Two forty-nine a.m.
Fifty minutes past two Fifty minutes past two a.m.
Fifty past two Fifty past two a.m. Ten minutes to three Ten minutes to three a.m.
Two fifty Two fifty a.m.
Fifty-one minutes past two Fifty-one minutes past two a.m.
Fifty-one past two Fifty-one past two a.m.
Nine minutes to three Nine minutes to three a.m.
Two fifty-one Two fifty-one a.m.
Fifty-two minutes past two Fifty-two minutes past two a.m.
Fifty-two past two Fifty-two past two a.m. Eight minutes to three Eight minutes to three a.m.
Two fifty-two Two fifty-two a.m.
Fifty-three minutes past two Fifty-three minutes past two a.m.
Fifty-three past two Fifty-three past two a.m. Seven minutes to three Seven minutes to three a.m.
Two fifty-three Two fifty-three a.m.
Fifty-four minutes past two Fifty-four minutes past two a.m.
Fifty-four past two Fifty-four past two a.m.
Six minutes to three Six minutes to three a.m.
Two fifty-four Two fifty-four a.m.
Fifty-five minutes past two Fifty-five minutes past two a.m.
Fifty-five past two Fifty-five past two a.m.
Five minutes to three Five minutes to three a.m.
Two fifty-five Two fifty-five a.m.
Fifty-six minutes past two Fifty-six minutes past two a.m.
Fifty-six past two Fifty-six past two a.m.
Four minutes to three Four minutes to three a.m.
Two fifty-six Two fifty-six a.m.
Fifty-seven minutes past two Fifty-seven minutes past two a.m.
Fifty-seven past two Fifty-seven past two a.m.
Three minutes to three Three minutes to three a.m.
Two fifty-seven Two fifty-seven a.m.
Fifty-eight minutes past two Fifty-eight minutes past two a.m.
Fifty-eight past two Fifty-eight past two a.m.
Two minutes to three Two minutes to three a.m.
Two fifty-eight Two fifty-eight a.m.
Fifty-nine minutes past two Fifty-nine minutes past two a.m.
Fifty-nine past two Fifty-nine past two a.m.
One minute to three One minute to three a.m.
Two fifty-nine Two fifty-nine a.m.
Essas são todas as horas em inglês por extenso para o período das 2 da manhã (02:00 as 02:59). Espero que tenha gostado. Não deixe de revisar essa tabela várias e várias vezes até aprender todas as opções de como escrever as horas em inglês, ok?